Everyone loves pizza, right? 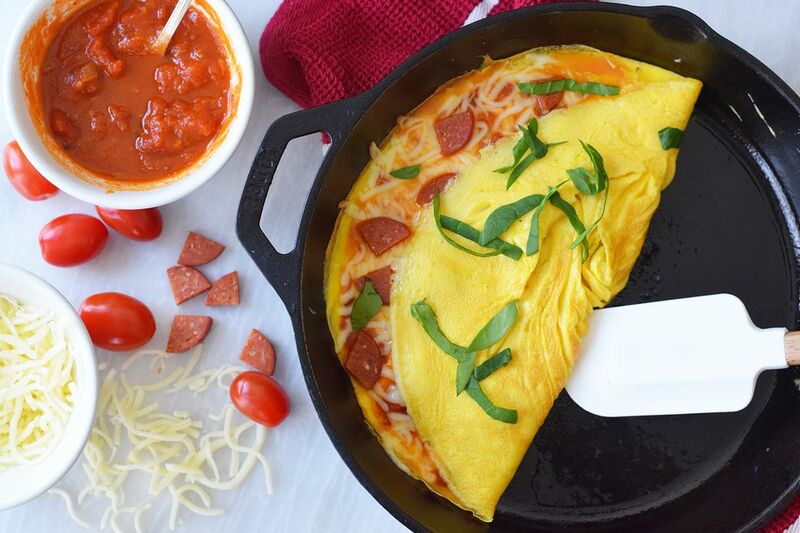 So, naturally, if you like omelets, you're going like this pizza omelet. It's one of those foods that you can serve as either breakfast-for-dinner or dinner-for-breakfast. It's full of gooey mozzarella cheese, spicy chopped pepperoni, and a simple tomato sauce but instead of a crust, you fold it all inside of delicate fluffy eggs. It's the perfect vessel for all of the cheesy and saucy goodness. An omelet is nice way to cook with kids, because they can help break eggs and whisk them and even little ones can put ingredients in bowls. Let them choose the toppings and help to sprinkle the sauce, cheese, and pepperoni onto this protein-packed choice for any time of the day. Beat the eggs with a whisk until the yolks and whites are completely combined. Season the eggs with salt and pepper. Heat the olive oil in a non-stick or cast iron skillet over medium-low heat. Swirl the olive oil to completely coat the pan. Then turn the heat down to low. Add the eggs to the pan, swirling quickly to cover the bottom. Adjust the heat if needed so that the bottom doesn't brown too quickly. Use a rubber spatula to move the eggs from the edge to the center, exposing parts of the pan so that the egg can completely cook. Then leave the eggs undisturbed and allow them to cook until the omelet is almost set. When the omelet is almost set, spoon the warmed tomato sauce over half of it. Cover the tomato sauce with the shredded cheese and pepperoni. Cook for 30 seconds, until the bottom is just about to brown. Fold the omelet in half. Cook for another 30 seconds or so, until the cheese is melted and everything is heated through. Serve with a little chopped basil or parsley if you wish and dig in! Pick a pizza sauce that you really love. It will provide most of the flavor in the omelet. You can also make your own homemade pizza sauce. Add more salt and pepper if needed when serving, or add a sprinkle of parmesan cheese on top.